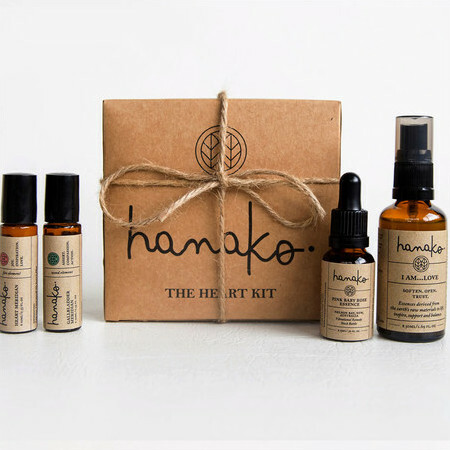 The Hanako Therapies Heart Kit is perfect for supporting emotions of the heart such as heartbreak, loss, trauma, and relationship difficulties. This pack is a beautiful gift for anyone who needs unconditional love and support. *Pink Baby Rose Essence 15ml. Apply two drops under the tongue per day. Use for two to three weeks to encourage emotional clarity and love. *I am... Love 50ml. Spray this essence over the crown of the head and all over your body. Take a deep breath, relax, and repeat the affirmation: "I am strong, confident and beautiful in my being. I am divine love." I didn't enjoyed this product as a perfume. This set has nice guide to use the products properly. If you are into self healing and meditation, this will be good. The Hanako Heart Kit is just fantastic. The I am ... Love scent is my favourite (I am... Bold is a close second) and the other two meridian scents that come with the kit are fantastic, too. The set comes with little notes on how to use each of the products. The fragrances do not linger for a very long time but while they last, they are just divine!